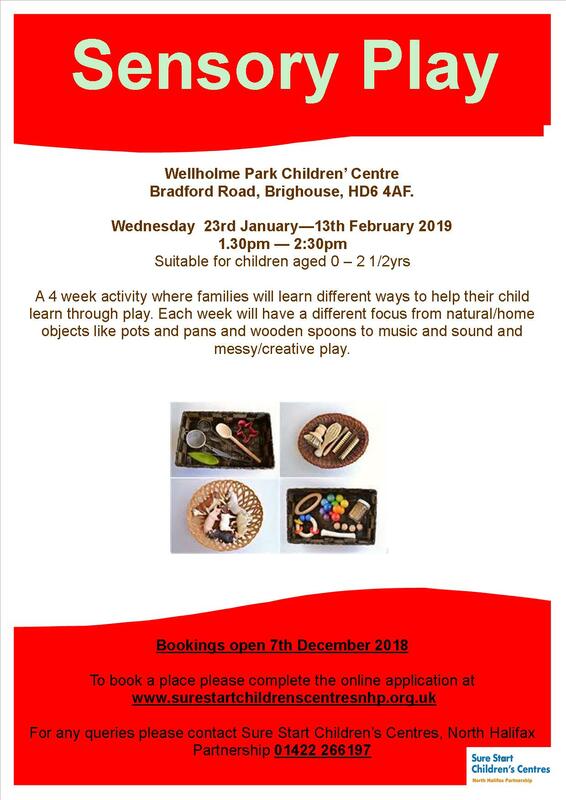 Sure Start Children’s Centres, North Halifax Partnership will be hosting Sensory Play Sessions at Wellholme Park Children’s Centre, Bradford Road, Brighouse HD6 4AF starting on Wednesday 23 January, 1:30am-2:30pm. In the 4 weekly sessions suitable for children 0 – 2½, families will learn different ways to help their child learn through play. Each week there will be a different focus from natural/home objects like pots and pans and wooden spoons to music and have messy/creative play. This entry was posted in Brighouse, Feb, Jan, Sure Start and tagged NHP Sure Start Children’s Centre, Wellholme Park Children's Centre.